Situated 10 miles South of downtown Charlevoix, this is the absolutely perfect property for entertaining, business retreats or just a relaxing vacation. The unique, one of a kind, spacious 6250 square foot home situated on 5 scenic acres sits high atop a bluff that overlooks undeveloped wilderness below and Lake Michigan in the near distance. The home offers 3 floors of unparalleled Lake Michigan and countryside views. One large wraparound deck on the main level and another smaller observation deck on the 3rd floor provide absolutely breathtaking views anytime of year. Incredible views of Grand Traverse Bay, Leelanau Peninsula, Mission Point, Northport and more. Watch the sun rise on the East side and watch it set into Lake Michigan on the West. 3rd Floor Excitement- : The unique 2000 square foot 3rd floor includes vaulted ceilings, draft beer dispenser (beer not included), the workout area with a treadmill a Bowflex style home gym, 55' LCD tv and a 'Klipsch' theater quality sound system. Two 8'x8' pane glass windows on this floor make the Lake Michigan and wilderness views unimaginable. *This property is lake VIEW. The nearest beach (relatively private as it is not known to people not familiar with the area) is a scenic 2 mile drive through beautiful countryside. There are more populated beaches with full amenities, a short distance further. *This property does not have air conditioning. There are 56 windows in the house and many with screens on each floor, 7 ceiling fans and 4 floor fans. Uncomfortably hot days are rare due to the favorable breezes off of Lake Michigan. The character, the spaciousness and the absolutely priceless, unmatched year round, expansive, one of a kind, Lake Michigan and wilderness views. The view is the #1 compliment received when people visit. It is stunning year round and truly one of a kind. The interior of the property is large, open and clean. You won't be disappointed in any aspect of your stay. This stunning home with unquestionable character is unlike any other you've experienced. Completely rebuilt in 2005, the first life of this home was as a boarding house in downtown Charlevoix. It was disassembled, moved and reassembled at it's current location. All of the systems of the house were replaced including electrical, plumbing, heating, etc. Multiple decks with collectively over 3000 square feet of space, stainless appliances, expansive granite counters, high ceilings, original hardwood floors, 5 original claw foot tubs, 52 new Pella windows, 2 new 8'x8' double pane glass panels overlooking Lake Michigan on the 3rd floor, and multiple original windows add to this home's incredible uniqueness. Rural, remote setting. Wildlife abounds. All within 10 minutes of downtown Charlevoix. There are 5 antique claw foot tubs in this home. Lake Michigan View, NOT Lake Front. Nearest beach is 2 miles away. Linens are provided for each permanent bed and one of the Aero beds. An additional linen set for the 2nd Aero bed can be provided upon request. Ample parking for multiple vehicles and trailers, etc. Bath towels are provided, including bath, wash cloths, and kitchen towels. Beach towels are not provided. One treadmill and one home gym similar to a Bowflex. 2nd floor sitting area with large screen tv and 2 couches seat 6. 3rd floor recreation area with large screen tv and stereo has 2 permanent and multiple portable chairs. Two refrigerators in kitchen area. Coffee maker and condiments provided. Basic spices, paper towels, tin foil, zip lock bags, etc. provided. When guests arrive they will have enough paper supplies, etc. for several days. Dishes, silverware and utensils are provided. Fully equipped kitchen with all cookware, utensils, etc. 12 total seating. 6 at the main kitchen table, 4 at the kitchen bar area and 4 at a table in an adjoining room. There is ample area for additional chairs both inside and outside on the spacious deck. 3 televisions. One small wall mounted unit in 1st floor bedroom, one large wall mounted unit in the 2nd floor sitting room and one large unit on the 3rd floor. 2600 square foot main first floor deck. Antrim Dells golf course is a couple miles away. Large, well equipped kitchen with granite counter tops and stainless appliances including 2 ovens. Main floor butlers pantry includes an additional full size refrigerator and a second dishwasher. High ceilings throughout the home, hardwood floors on the main floor and windows in every conceivable location add to the stunning beauty. Enjoy the large main deck along with a picnic table for entertaining. At night, light the torches that surround the deck and add another layer of beauty or simply count the falling stars which cross the night sky laden with billions of twinkling stars and planets. Interested in a bonfire? Take advantage of the extra large fire pit (wood included) and melt smores as you watch the sun set into Lake Michigan. There is an additional picnic table at the firepit. Very large house with many rooms and great views. Quiet and close to Lake Michigan beaches in Norwood. Beautiful sunset viewing on the back deck and the night sky was amazing. 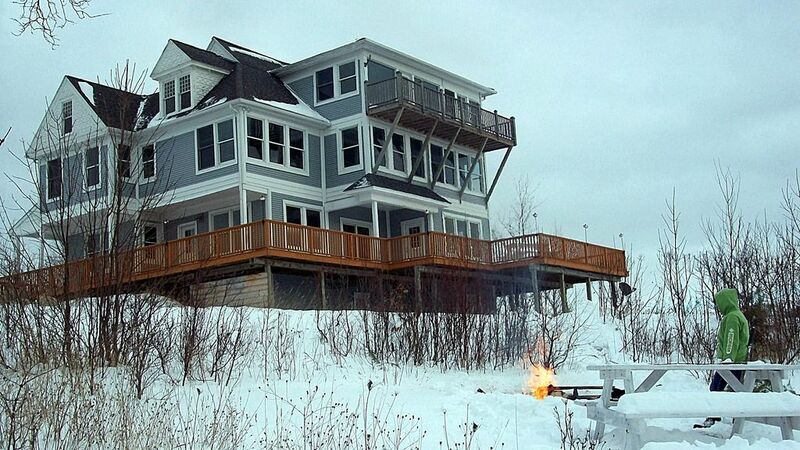 The house has everything you need for a Northern Michigan getaway! Always a pleasure seeing you and your family/guests. I'm glad the weather held out for your ride and your daughter's birthday celebration. Guests who return to stay at the property make up a large part of my Summer reservations at this point so it's becoming like seeing family every year. That's one of the reasons I provide the return stay discount as my way of thanking people for choosing my property again. Looking forward to seeing all of you next year, in the meantime if you have time for a Fall ride, hit me up and let's shoot up to the UP. We just concluded a great trip at this wonderful home. Stan was very accommodating and easy to deal with. The home was clean and the views were amazing. We all especially enjoyed the various trails around the property. The home is in a great location, within 10 miles from the town of Charlevoix, and centrally located within 20-30 miles from several awesome golf courses. Thanks Stan for letting us rent your incredible home! Thanks very much for your positive comments and for taking the time to write the review. The central location of the house makes it an ideal jumping off point for many Northern Michigan activities, including golf and as you noted there are many high quality courses located in the area. The trails right out the door, spectacular views, dark starry nights, bonfires and the character of the house are also popular and have led to a number of return guests. Stan was super nice and very accommodating. Thanks for everything. We enjoyed time on the beach at Fisherman's Island State Park. The views were fantastic at the house. This was a great place for my wedding party to stay. Reasonably priced and great views. Plenty of space to spread out. The house is a little quirky but that is what you get when it was built in the 1800's. Great sound system and deck for enjoying the expansive private view. Thanks for taking the time to write your review, it's much appreciated! It was a pleasure meeting both of you, I'm glad you enjoyed my property and some of what it has to offer. Good luck to you both moving forward in this new chapter of your life! Stayed here with lifelong friends, every year we take a long weekend. This time was later than most and we found this place online. Really nice place and all of us decided the only thing that could have made it better was warmer weather. It was October in northern michigan though so we knew it would be a gamble. The accommodations and surrounding view are better than we expected. Very nice! Several of us are returning next year with our spouses and families. Thanks very much for your review! It was a pleasure to meet you and your girlfriends. It's unfortunate that the weather turned on you, however, that's one of the benefits of this location, there's always plenty to do within a short drive. Thanks for your Summer 2017 reservation. Looking forward to seeing you again and meeting your family. Midwest Living Magazine has ranked the Charleovoix/ Petoskey area (aka, Michigan's 'Gold Coast') the #2 destination in all the Midwest! 'These neighboring resort towns along the Lower Peninsula’s northwestern shore began entertaining vacationers who came by steamship more than a century ago. No wonder they’re so good at it, offering an ever growing to-do list for travelers and a relaxed attitude. Petoskey climbs hills along Little Traverse Bay, and Charlevoix nestles between Lake Michigan and Lake Charlevoix. The beach and harbor are steps from the 100 shops and galleries of Petoskey’s Gaslight District and landmark Stafford’s Perry Hotel. Charlevoix’s boutiques string along the waterfront. In the warmer months, visitors golf at the Inn at Bay Harbor, a first-class resort with courses heralded as the Midwest's Pebble Beach. Excitement is all around this property! Shopping, swimming, world class golfing, charter fishing and more! Don't forget Fall on Michigan's Gold Coast! Experience Fall colors like never before right from the comfort of this property. Avalanche Bay Water Park, Solace Spa and Boyne Mountain golf within 40 minutes. Semi-private Lake Michigan beaches, rustic parks and trails within 2 miles or just walk the property and enjoy the scenery!